It's the ideal location, just 50 steps to the boardwalk and 'toes in the sand' and a few blocks from Belmont Amusement Park. This charming two story Mediterranean-style casa occupies one and a half floors of a three story duplex. Invite your family friends and rent the whole duplex, 5 bedrooms and 4.5 bathrooms! Ground level - The fenced patio area faces the charming shrubery-lined sidewalk of Jamaica Court. The Picnic table, Adirondack chairs and gas BBQ allow you to enjoy the true California casual beach lifestyle with an ocean view, sound of the waves and smell of the ocean. Enter the sliding glass door into the saltillo-tiled livingroom with colorful Mexican-tiled fireplace. A new queen sofa sleeper with a memory foam mattress provides an extra sleeping option. There is a large flat screened cable TV in the livingroom but every bedroom also has a flat screen TV. Wifi and unlimited nationwide (plus Canada and Mexico) calling. The open California-style modern kitchen with new appliances, looks out over livingroom and dining area with a table for 6 plus two breakfast bar stools a few feet away. Just behind the kitchen is the the master bedroom with a new king bed and a bathroom with an easy walk-in shower. Upstairs are two more bedrooms, one with a queen bed and one with two twin beds. All bedrooms have TVs and DVDs. There is a bathroom with a tub/shower combination between the two bedrooms. 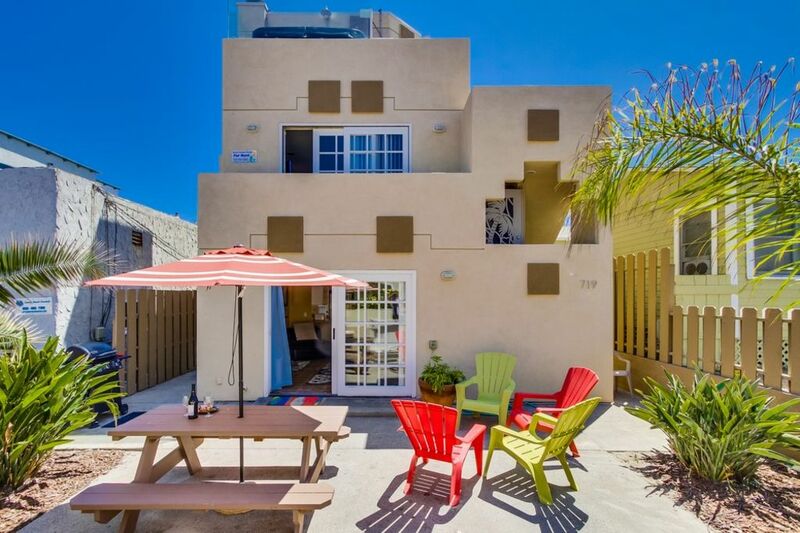 Stacked washer/dryer, tandem parking for two cars, bikes, beach chairs, beach umbrella, sand toys, etc. This is the perfect location for a family vacation you will long remember and long to come back to. Mission Beach with it's miles of white sand and Boardwalk. White water view from patio area in front. Large TV, sliding french door out to Patio and 2 sofabeds (double-size). Two barstools at breakfast bar and two folding chairs in closet. There are 4 TVS. 50 inch in lvrm and one in each bedroom. Time Warner cable TV expanded programming and two Movie channels. There are 4 DVD players, in lvrm and each bedroom. Riding bikes on the boardwalk and watching the sunset on the ocean are free! Fresh seafood restaurants, Balboa Park and the World famous Zoo and Safari Park, SeaWorld, awesome floating museums like the Midway, the Wave and the Vintage Wooden Roller Coaster at Belmont Park, Old Town, GasLamp District, Little Italy, the view from Cabrillo National Monument and State Park, Sunset Cliffs and the tide pools, Point Loma Seafoods, Rubios, lots of ethnic restaurants. Come play in sunny San Diego!